This bird flew across in front of me, a little smaller than a pheasant, bigger than a pigeon. Main colours Green and Blue with Scarlet Red flashes on its wings (I think underside) Black crest on head. Spotted in Aldersbrook London E11. 2 Definately not a Shag. I dont think its a UK/European bird, seemed more tropical, shortish yellow/orange beak. Slow wing beat sort of gliding flight. Black tufted head. I have just been watching Wild Africa on Yesterday and there it was, a Great Blue Turaco, from central and west Africa. 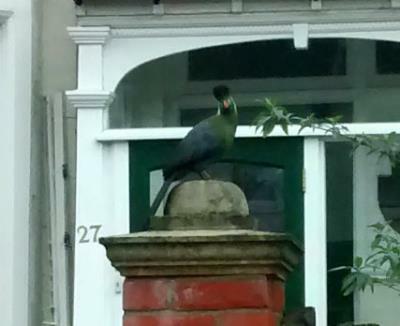 Checked it out online, and yes definately a Great Blue Turaco, just need to find out what it was doing there.